(TibetanReview.net, May06, 2016) – The Central Tibetan Administration (CTA) at Dharamshala, India, has on May 4 expressed condolences on the passing away of Sakya Dagchen Rinpoche, the Seattle-based head of the Phuntsok Phodrang branch of the Sakya lineage of Tibetan Buddhism. He was reported to have passed away at around 8:15 pm on Apr 29, aged 88. The Kashag, the cabinet of the exile administration, held a prayer service for the Rinpoche on Apr 5. All offices of the CTA remained closed after the prayer service. 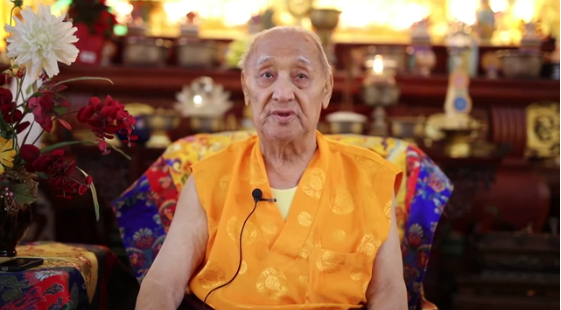 The Tibetan Parliament-in-Exile also expressed condolences to the family and devotee of the late Rinpoche. The headship of the Sakya school of Tibetan Buddhism is held on hereditary basis between the Phuntsok Phodrang and the Rajpur (India)-based Dolma Phodang. Although historically held on lifetime basis, the two families recently reached an understanding to hold the headship on three-yearly terms between them.